Q. I started a blog last month, and have absolutely loved sharing, creating and posting on it, however, I am interested in creating more traffic and getting the word out about it. I was wondering if you had any blogger advice!! A. this is a good question. every blogger wants what you want, an audience. here is my advice: get out there. be original. do your thing. write your words. u be u. i applaud & admire bloggers who post their own material. i believe if you do this; people will come back because no one else is saying what you're saying. your ideas are original. you are unique. you are special. you have something important to say. (print that out and tape it to your computer monitor.) don't be too intimidated by the hundreds of beautiful blogs. and don't try to make your blog like someone else's. just be you. let inspiration fly. here are some ideas to make yourself known to the world. 02. create links to other bloggers on your own blog. if they're checking technorati.com or their site reader, they will come find you and be pleased as punch. forwarding traffic is also a nice way to say, hi bloggy neighbor. 04. if you're feeling really courageous, email a few of your favorite bloggers (personally of course, mass emails are not quaint) and mention something specific about them, tell them they've inspired you and that you've started a blog and would love to invite them to check it out. i'd advise you not to ask them to trade links with you. they will automatically add you to their list, blog about your creativity and sheer genius, shout your blog url from the rooftops if your style resonates with them and knocks their socks off. if this kind of free and fabulous advertising does not happen, do not fear, it is very rare. keep blogging. for your mom. for yourself. over time your blog and it's readership will evolve naturally. 06. in the end, i am a blogging amateur, so you may want to consult the pros over at thinkbakery.com. i love their advice on the matter. Q. What is your recipe for Mother's Day French Toast? A. i just have to say, dan is the best. for mother's day he whipped up the dish from my favorite cafe in southern california. it's called plum's. when we lived there, we indulged in a fun brunch every now and again. it has the perfect posh cafe environment while still being laid back and easy, it's not too spendy and a bit hidden away (not your regular over-crowded pinkberry stop. not everyone and their dog shows up. wait, strike that, yes, people come and bring their itty bitty pups, but still it's not hugely popular. yet). all i'm saying is that if your name is not hilton or lohan you can still get in. it's not uber hollywood fancy, but still uber fun. it was the first stop i introduced my sisters and mom to when they came for a visit. so if you want to be hip and wear big sunglasses and feel the typical OC vibe and hope to see someone famous (or at least see people who want to become famous) and get a delicious brunch on your way to a lazy saturday at huntington beach, you'll want to run to plum's cafe for french toast and freshly squeezed oj and other delectables that i never tasted because i didn't dare cheat on the french toast. go early my friends, by noon you'll have to stand in line. Q. 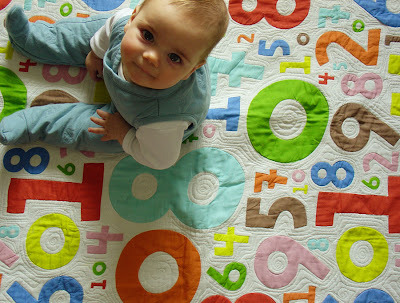 Where did that dear sweet Numbers Blanket come from?! 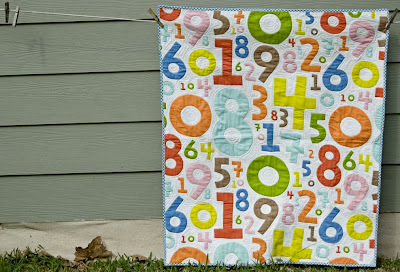 A. the Number Quilt that benji loves to play on, count his fingers and toes while sharpening his mathematician skills, is an original handmade beauty. 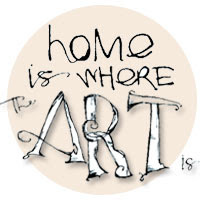 it came from this talented lady whose etsy shop, a stitch in dye, is filled with quilted creations. Great post! I truly love your blog and am inspired each time I read & look around at old posts (I just found you a couple weeks ago.) Thanks for sharing! i heart you. seriously, if the world was made up of all m.'s it would be a wonderful place! you always think of everything, marta! this is seriously good advice. i'm tucking it all away. i'm so happy that i have your blog to read. everyday. it's my favorite. ps. that quilt is just right- so adorable. Question? One that I am always asked is - "How many hours do you spend blogging?" I really love your honesty, your sincerity and your writing. 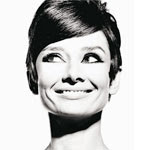 You have a wonderful style, full of warmth, personality and terrific tips. Your advice has been printed, pasted and stored! All of us in bloggerland appreciate you so! Plums on 17th is seriously amazing. If you're ever in the Newport area and want to try a new breakfast place, my top favorite is Alta's Cafe. It has new art on the walls from local artists every month or so and I'm in love with the eggs benedict there. I'm actually driving down there this weekend just to have some! I LOVE that quilt. just perfect really. I first discovered your blog through Ginnie's (she's a friend of my sister's), and I so enjoy your sense of style and expression. I look forward to peeking in nearly every day! I received a little bloggy hello from you and it made my day!! Thank you thank you! Question... This technorani thing, I can't figure it out! I'm embarrassed to say because I bet it's easy but I have played around with it without having to sign in, yes I'm one of those. But I keep hearing about it. to answer your question; www.technorati.com is quite simple to use, though it seems to be having technical difficulties at the moment. 02. in the top center search bar (inside the green header) paste your blog url address and click enter. 03. when it's working properly, technorati automatically shows a listing of websites/blogs that have linked to yours. it's nice to check it every once in awhile to see who has linked to your blog or website. i have found many new bloggers this way who have included my website in their posts. I adore reading your blog! And am really enjoying your Q&A. And of course, Benji and his quilt..just the cutest! for someone new on the blogging scene like me, this was very useful. i love your style of writing. and that is one great quilt! Great tips on blogging! thinkbakery.com looks like a wonderful resource. Thanks! That quilt is FANTASTIC! I want one for my bed! Great tips on blogging....but I would hardly call you a novice! I've had a blog for a year and a half and never heard of Technorati – thanks for the recommend! great post, thanks for the blog information. it is always great to hear an uplifting comment. your blog is just precious. oh my. i am in love with that quilt. Thank you for the timely advice to new bloggers. Your generosity in sharing what you know, instead of hoarding, is a huge part of what makes your blog so genuine, so friendly, so kind. Anne Lamott is not the only one whose words ring true. She's on my bookshelf, too, and what a phenomenal read, particularly during the first year of your first child's life. I also love this quilt!! So much fun with all the colors.